William Clarence Eckstine was an American singer of ballads and a bandleader of the swing era. 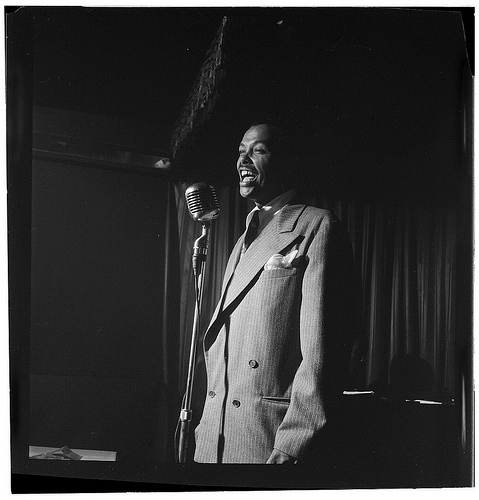 Eckstine's smooth baritone and distinctive vibrato broke down barriers throughout the 1940s, first as leader of the original bop big-band, then as one of the first romantic black males in popular music. Eckstine was a style leader and noted sharp dresser. He designed and patented a high roll collar that formed a "B" over a Windsor-knotted tie, which became known as a "Mr. B. Collar." In addition to looking cool, the collar could expand and contract without popping open, which allowed his neck to swell while playing his horns.." The collars were worn by many a hipster in the late 1940s and early 1950s. Legend has it that his refined appearance even had an effect on trumpeter Miles Davis. Once, when Eckstine came across a disheveled Davis in the depths of his heroin excess, his remark "Looking sharp, Miles" served as a wake-up call for Davis, who promptly returned to his father's farm in the winter of 1953 and finally kicked the habit.